HOW COLONEL CODY'S COWBOYS RODE SOME WILD HORSES OF THE PONTINE MARSHES. ROME, March 4.—All of Rome was excited to-day over the trial of Buffalo Bill's cowboys on the wild horses furnished by the Duke di Sermoneta. For several days the Roman authorities have been superintending the erection of extra barriers to keep the savage steeds from reaching the audience. These animals came from the Duke's famous herd on the Pontine marshes, and he declared that no cowboy on earth or anyone else could ride one of them. The cowboys laughed at the boast, and then the Duke dared them to mount any one of six he would send them. Every man, woman and child in Rome expected that two or three men would be killed in the experiment. Over two thousand carriages were driven to the Prati di Castell, and an audience of twenty thousand people braved the dripping rain. The American colony turned out in full force. 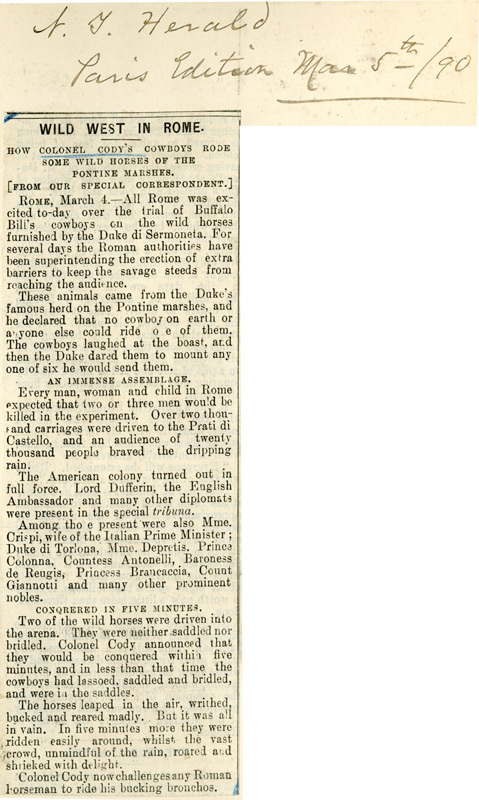 Lord Dufferin, the English Ambassador and many other diplomats were present in the special tribuna. Among those present were also Mme. Crispi, wife of the Italian Prime Minister; Duke di Torlona, Mme. Depretis, Prince Colonna, Countess Antonelli, Baroness de Reugis, Princess Brancaccia, Count Giannotti and many other prominent nobles. Two of the wild horses were driven into the arena. They were neither saddled nor bridled. Colonel Cody announced that they would be conquered within five minutes, and in less than that time the cowboys had lassoed, saddled and bridled, and were in the saddles. The horses leaped in the air, writhed, bucked and reared madly. But it was all in vain. In five minutes more they were ridden easily around, whilst the vast crowd, unmindful of the rain, roared and shrieked with delight. Colonel Cody now challenges any Roman horseman to ride his bucking bronchos.